One currently pivotal global challenge for scientific research in the digital age concerns the potential contradiction between (largely) automatized processing of an ever-growing amount of data and the need for validating, verifying and securing results. This two-day conference will illustrate how these essential challenges regarding data provenance, collection, storage, processing and interpretation are tackled in a number of different disciplines such as physics, bioinformatics, materials science and the digital humanities as represented by computational linguistics. In addition to gathering state-of-the-art facts and insights from these different subjects, the conference aims at promoting exchange and reflection from a broader, interdisciplinary perspective. The focus will thereby lie on methodological issues and deliberately refrain from addressing -equally essential- ethical and legal aspects. 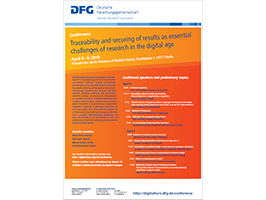 The conference is part of the Digital Turn in the Sciences and Humanities project launched by the Head Office of the German Research Foundation with the aim to assess and respond to key developments in the sciences and humanities in the digital age. University of Bonn) Can knowledge inform Machine Learning? (Lausanne University) What is a measurement record?